The construction industry has been growing at a steady pace since 2011 and after a robust 2018, code professionals are looking to enhance building processes, add efficiency and help build the future. Recognizing this trend, newly elected International Code Council Board of Directors President William R. Bryant, MCP, CBO, spoke on the importance of building safety and prepping for the future by adopting and enforcing building codes to prevent structural collapse, natural disasters and fires; building resilient communities to withstand future disasters; and adapting along with advancements in digital transformitive technology. Below are Bryant’s full remarks as incoming Code Council board president during the Annual Banquet on Oct. 23, 2018, in Richmond, Va.
It’s such an honor to stand here before you this evening. I would like to thank each and every one of you who has helped me get to where I am today. Thank you to my family and my sister. Your love and support mean the world to me. Especially my wife… Without her love and support I would not have enjoyed such success in my life. Thank you to my 99-year-old mother — without her, I would not be here tonight. Thank you to my supervisors and colleagues in Anne Arundel County. 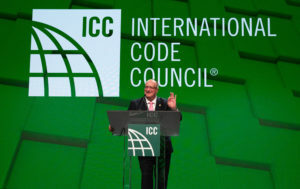 Without their support and assistance, my participation with the International Code Council would not be possible. Thank you to the Maryland Building Officials Association and Region 7 for supporting me throughout my career. Thank you to the city of Richmond and all our Virginia members who have helped make this conference such a success. Thank you to Dominic Sims and the entire Code Council staff. Your hard work has helped our association become the leader for the built environment. Tonight, I want to talk about the theme of my presidency: Working today to prepare for tomorrow. Give that some thought… Everything we have done in the past has prepared us for today. Everything we do today impacts tomorrow. Building safety is about preparing for our future. Many of you in this room were part of the initiative that founded our association as it stands today. Three regional organizations recognized the need to develop a single set of national codes and standards to preserve the greater good. Since its inception, the Code Council has had the foresight to address public safety for the betterment of all our citizens…present and future. We develop, adopt and enforce building codes to prevent structural collapse, fires and loss of life. We build resilient communities and robust safety systems to withstand natural disasters and the tests of time. We embrace new technologies, building methods and materials. We integrate scientific advancements and engineering innovation, and address emerging trends. We never settle for the status quo. That is why our organization continues to thrive. We work today to prepare for tomorrow. As society has evolved, so have we. We have embraced the digital age with resources such as premiumACCESS. We have engaged our younger generation, and we have increased participation through cdpACCESS, online training and PRONTO certification exams. We have expanded our business model to welcome S.K. Ghosh Associates and General Code. We have broken new ground by creating the Alliance for National and Community Resilience. Our International Accreditation Service and ICC Evaluation Service subsidiaries continue to be unmatched in the marketplace. 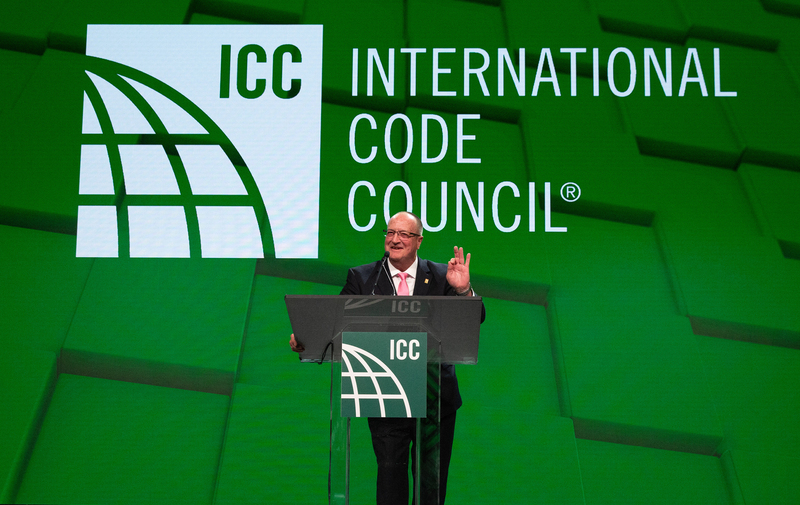 The International Code Council sets the bar high for our industry and leads with innovation. During my next year as president, I plan to continue these initiatives to ensure our association remains at the helm. I am exploring ways to allow eligible members to remotely vote on business items during our Annual Business Meeting, including resolutions and board elections. This effort will demonstrate the Code Council’s dedication to member participation and empower those who cannot attend in person. As we work today to prepare for tomorrow, we must carefully consider how we can continue to grow and thrive as an association. Our profession is facing a severe shortage of skilled workers. The Code Council’s workforce initiative, Safety 2.0, is leading the way to welcome the next generation of members and leaders through mentoring, education, and outreach programs. I want to thank all my predecessors for making this a priority. During my tenure, I will expand this focus and ensure we are doing everything we can to educate and attract the skilled leaders of our future. Because if we all work today, we prepare our tomorrow. Working for today to prepare for tomorrow is all about you: our membership, our association, our future. It’s about people helping people. I look forward to working together over the next year. Thank you again for your support.